Join Adventure Café & Grand Tour Cycling on the very latest in our series of classic Cycle Sportive Events. This one is a truly special ride, crossing the mighty Severn Estuary, riding down the Wye Valley Area of Outstanding Natural Beauty, and even incorporating the Cotswolds too. Be prepared for a very memorable day in the saddle. Expertly prepared by Adventure Cafe and Grand Tour Cycling, with top quality feed stations, friendly event staff, and a carefully planned and marked course - this is everything you are looking for in a Cycle Event. We shall assemble in Gloucester early on Sunday morning, where you will have parking, and space to get prepared. Teas and Coffees will be available from early, and registration will open from 07:30. We shall organise departure into waves, and then its out the road - heading across from Gloucester into the borders and Wales before descending the River Wye. As the river empties into the Severn, we shall head across the enormous road bridge, and back into England, where we shall start our climb back up to Gloucester, at first following the estuary, but then sliding across towards the scenic Cotswolds. This event is an exclusive fundraiser for Rugby for Heroes, the Gloucester based Charity for injured servicemen. In conjunction with Grand Tour Cycling this ride promises some of the finest riding in the country... When you've finished, let us know what you think? What is a Level 4.0 Cycling Challenge Like? You are now moving into the realms of serious cycling challenges. Cycling days will be up to 10 hours (stops included), or slightly less if the event stretches over several days. You should have very good cycling fitness, with good leg strength, and you should be used to putting in regular training rides most weekends - with some good long rides. Most folks will consider these rides very long, and very challenging. Expect a mixture of length and terrain (think hilly!). How Fit Do I need to be to join a Level 4.0 ‘Bike Ride’? To participate in these events you need to be in good cycling fitness. You probably are capable of riding at high speeds for 2 to 2.5 hours, around 23 - 25 km/hr. And you should be used to riding long distances and over hilly terrain. If you do not cycle regularly you must be of very high fitness level - and should think about converting as soon as possible and getting on to a bike - you will need to develop your specific strength and cycling technique. Do not come on these challenges without having spent plenty of time in the saddle. Training rides should be up to 60 or 70 miles, and you should have done a few like this. You should be getting out on your bike most weekends in the run up to your event, seeking out longer climbs to improve your climbing fitness for the event. Parking at start of Event (limited number of spaces). Toilets at start and en route. Pre Event Cycle Event Hotline. Transport to start of event. It is your responsibility to thoroughly check the proper operation of your bicycle prior to the event. It is also your responsibility to ride safely at all times on the course - this especially applies to any downhill sections - where you need to keep your speed under control, and taking care at any time you overtake another rider. This ride is on open roads - and whilst we attempt to use smaller roads, you need to be courteous to other road users. Being in the UK we should be prepared for anything. Whilst not wishing everyone to bring heaps of equipment we should be prepared for wet and cold. 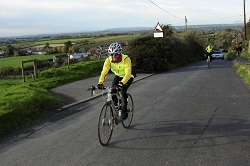 This is our standard range of Cycling Challenges in the UK, Europe and further afield. However, we offer completely tailormade itineraries to your specification. Call us to discuss! Please note that for overseas point to point cycling challenges we can transport soft cases for bike transport - but not hard cases, due to space limitations on board our support vehicles. On all our cycling events, please pack sensibly and bring a reasonably sized soft holdall type bag. To participate in an overseas Adventure Cafe challenge - you must carry Travel Insurance (to be for the activity you are participating in, and to include repatriation to the UK). Please also note that you should have a good level of cycling experience and be competent to handle your bike. We ride on roads shared with other vehicles - and you need to be able to deal with this safely.